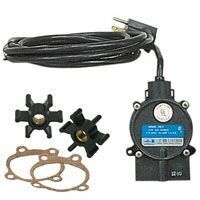 Little Giant 9EN-CIM (509207) is a 4/10HP, Manual, dual-purpose Sump Pump/Effluent Pump with an oil-filled motor (lubricated for life) and a 20ft power cord. Little Giant 9EN-CIM "Eliminator" series pumps are designed for a wide range of residential, commercial, industrial and agricultural applications with low to medium effluent waste and wastewater tranfer demand. 509207 model is capable of handling solids up to 3/4" in diameter and comes with a 1-1/2" FNPT outlet. A powerful 4/10HP motor is capable of pumping up to 80GPM of wastewater at 5ft of head pressure drop. The pump housing is made of epoxy coated cast iron for enhanced corrosion resistance and includes other composite and stainless steel non-corrosive parts.